I was out shopping with Puddin the other day, perusing the aisles of our neighborhood toy store. 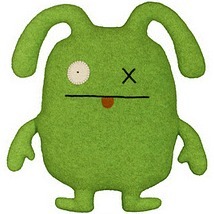 I stumbled into what might possibly be the cutest damned thing I have ever seen...the Uglydoll. These simple plush little monsters come in all shapes, sizes and colors. I asked the store owner about them and she said that these were the hottest items she had in the store. My immediate thought was "Damn! Why didn't I think of that. These things are just weird shaped pieces of felt sewn together with silly faces on them. I could have sewn a sock with googly eyes on it and called it Socko the Sock Seas Monster. Curse you God! Why don't my dreams come true?! Why do you test me like this?! I have dreams! I have inspirations! Don't you know that I now have 4 mouths to feed? Why can't I have stuff! I want stuff!" After I was asked to leave the toy store and never come back (I guess I must have verbalized half of the diatribe that I thought was just in my head), I went home and did a little bit of research on the Uglydoll. What I found was a solid reminder that if you want things, you need to do things. Ten years later, Uglydoll has gone from being a doodle on a letter, to a toy and book empire. So the moral of the story is that if you want something in this world, get off your duff and do it. Even if it is creating just one poorly made prototype out of tape, sticks and hope. That is one step closer to your dream. Go do it. It will lead to the next step, which will lead to the next step. Eventually you will find yourself down a path, where you are bringing your ideas to life. Go make some thing ugly today!!! Do you have a dream or scheme that is going to take you from check-to-check Charlie to Daddy Morebucks? What are you doing to bring this idea to life? Let us know.